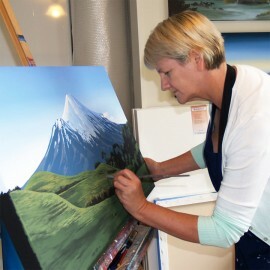 Located in Christchurch, I paint contemporary acrylic landscapes. I began classes with a local artist from a young age and continued in art through high school. From school I left New Zealand for England where I attended Medway college of Design. On my return to New Zealand, I had a private exhibition in Auckland. At home with a young family I took up ticket writing and also worked as a finish artist. When I had the time I also ran children’s art classes. With a grown up family I now work from home as a full-time artist.